Stems ascending, a few inches high, spreading by slender runners 3 inches to 1 or 2 feet long; the pubescence of the stem, petioles and peduncles spreading. Leaves petioled, digitately five-foliated; leaflets oblanceolate to oblong, blunt at the apex, narrowed at the base, one-half to 1 inch long, toothed. Flowers yellow, one-fourth to three-fourths of an inch broad on slender, axillary, one-flowered peduncles; the first flower appearing from the axil of the second stem leaf; petals five, broadly oval, slightly longer than the acute calyx lobes and the linear-lanceolate bractlets; stamens about twenty. In dry soil of meadows and fields, New Brunswick to Georgia, Minnesota and Texas. Flowering from April to August. The genus Potentilla contains a number of representatives in New York, several of which are introduced species. 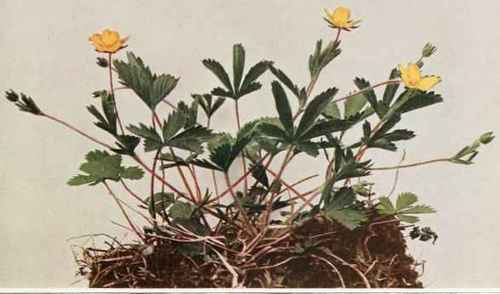 Of these, the most common is the Rough Cinquefoil (Potentilla monspeliensis Linnaeus), with stout, erect, hairy stems and leaves, and yellow flowers in which the calyx lobes exceed the petals in length. The Silvery Cinquefoil (Potentilla argentea Linnaeus) is a native species of dry soils or rocky places, with spreading or ascending, white, woolly-pubescent stems, leaflets green and smooth above and white-tomentose beneath, the margins revolute, and small yellow flowers.